Moving on now to our current pet companion - Bunk. The Bunkster. The Bunkinator. Sir Bunkalicious. My husband and I were both raised with dogs and he's clearly a dog person. He grew to love my cat Pierre but he always wanted a dog. After Pierre was gone it was a while before we were ready for another pet. 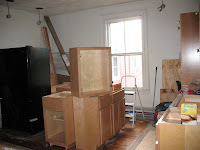 And then there was the kitchen renovation - who really wants to bring a new dog into the house when it looks like this? He's still a puppy and there have been some bumps along the road but we can't imagine life without him now. By the way, if you're in the Boston metro area we have some great dog-related recommendations. Looking for a veterinarian? Check out Highland Animal Hospital (they're great for all pets!). Need someone to walk your dog or take them to playgroup? 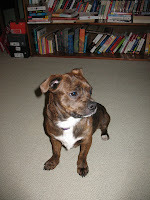 Look no further that Wags 4 Walks, you can't imagine how excited Bunk gets when it's time to go to playgroup. Finally, if you need some help with training, Dan from Cavalletto Canine is amazing. Thanks for the compliment. I am really enjoying your blog (as another woman in my 30s!). Bunk has definitely been worth it, especially when he snuggles into my lap. Looking forward to hearing/reading about your future dog!